The Dog Show is coming to RNG Gallery/ Dixie Quicks June 13-14 for a short two-day showing. Omaha “street art” collectors Laura Vranes and John McIntyre have dreamed up a new art concept to be launched in the Omaha area. 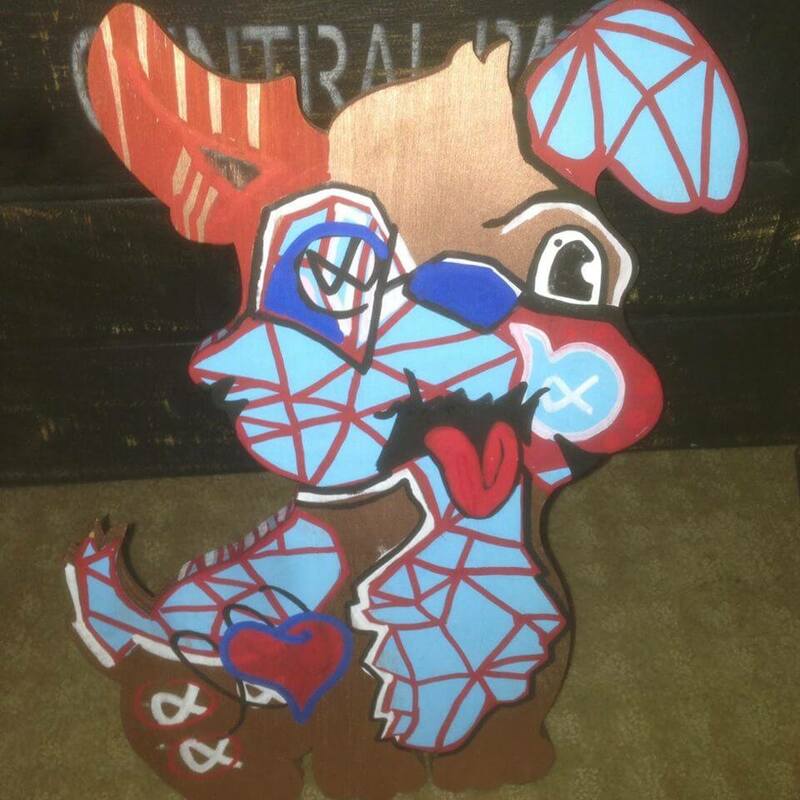 Called Adopt Art Omaha, they’ve asked local artists to paint wooden dogs in any style or point of view chosen by the artists. After the weekend exhibit, the dogs will be hidden starting the third week in June through out the summer at various Metro Omaha and Council Bluffs sites. Clues will be posted on their Facebook and Twitter to lead the public on the search for the painted dogs. This unusual project promises to be a fun highlight of the summer, as it involves a scavenger hunt throughout the Metro Area with the prize being a piece of art for the lucky folks who find them. Based on their fascination with Banksy, the world-renown rogue artist known for plastering art on buildings throughout the world, the couple first started collecting his art, as well as other street artists. After reading about the many public art projects going on of late, Vranes/McIntyre decided to plan their own local event. Many of the artists who’ve painted a “Banksy” are widely known in Omaha’s art community: Watie White, Kim Darling, Joel Damon, Sarah Rowe, Bart Vargas, Liz Vercruysse, Nolan Tredway, Jeff King and Reggie Le Flore among many others. Many Omahans have come to expect projects to be proffered by the creative artist community over the years. All who join in this big hunt can travel the Metro area or follow it on Facebook like so many did long ago with the J. Doe Project in 2001 or Jaime Burmeister’s small clay “Vermin” more recently. The planners hope people who find “Banksy’s” will post themselves with their finds on Facebook or Twitter, adding to the fun of the event. Vranes and McIntyre are footing the bill for this art project to again add color and excitement to the city scene. And artists are again demonstrating their largess by donating their design talent and time. Omaha artist Linda Hatfield’s “Banksy” is painted to show a sad “Banksy” prior to adoption along with the happy to be found/adopted rendering on the other, shown above. Painted in Hatfield’s trademark bright, fun style this work demonstrates the quality of the offerings from local artists. RNG Gallery/Dixie Quicks is located at 157 West Broadway, Council Bluffs. Exhibit hours for this show are limited to 6-9 p.m. June 13th and 9 a.m. to 2 p.m., June 14. How the Rose Tackled the Prodigious ‘Poppins’A popular show pops, sparkles and shines.